Opening spread, illustration, typographic look-and-feel and color palette for the central feature story in a multi-article section of a themed annual Inbound Logistics special issue. 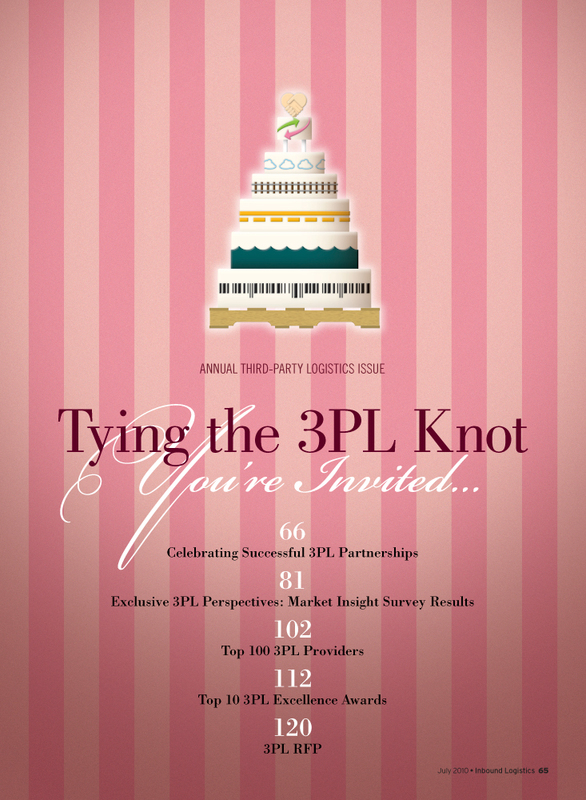 The Challenge: Tie together a themed issue—cover, main feature (above), Top 100 company comparison, and industry research—with 3PL (Third Party Logistics) partnerships as its central theme. 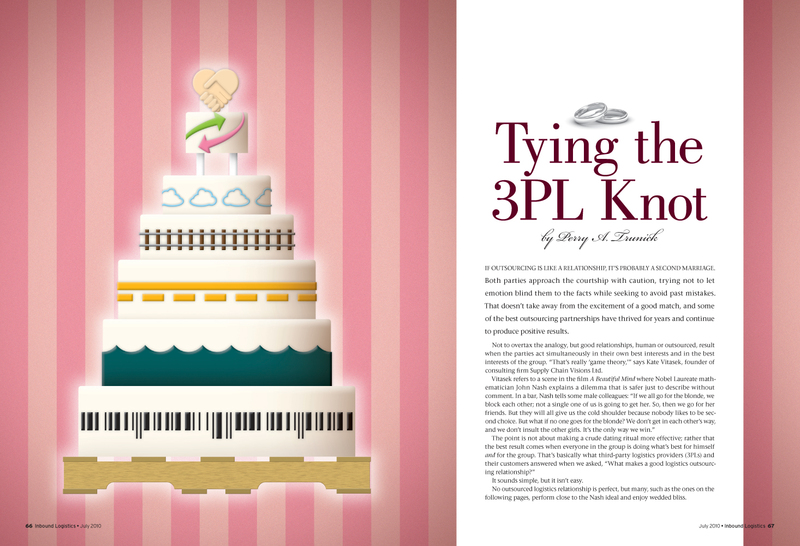 The Solution: To avoid the usual business partnership stock photography cliches that could have been used, the editorial hook of looking at a 3PL partnership like one would a marriage—with many potential benefits and pitfalls—was what we decided to pursue. That brought with it its own set of iconic images. 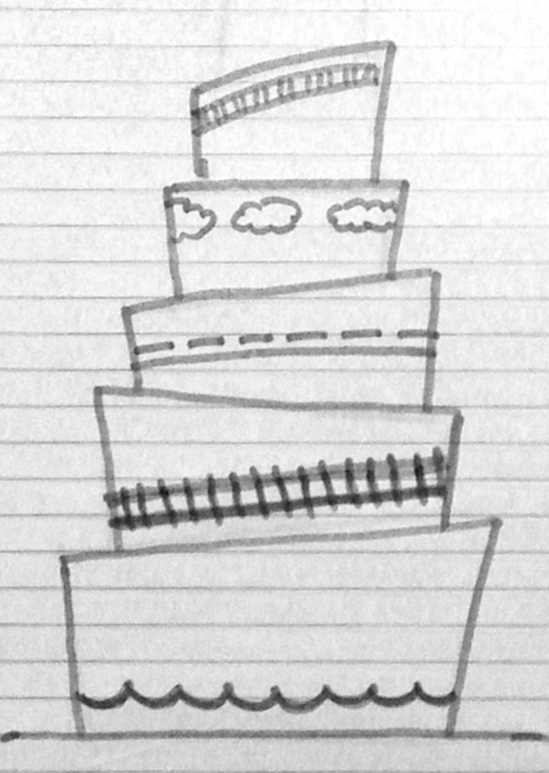 After tossing many of those—tin cans tied to a car, wedding rings, etc.—we settled on a wedding cake that would be “iced and decorated” to reflect the types of logistics services 3PLs provide. The section was kicked of with an “invitation” cover page/mini-TOC (below). 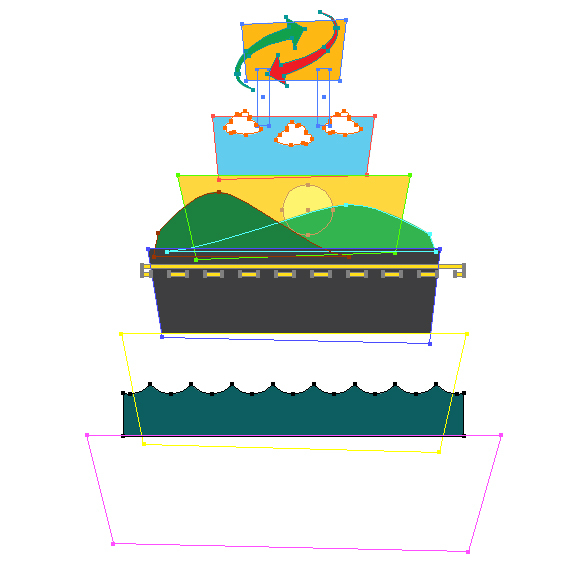 The Process: I started with a simple sketch (below) to visualize a tiered wedding cake for which each tier represented a mode of transportation. The editor and I discussed everything from doing a custom illustration to commissioning a bakery to create an actual cake that we’d photograph. 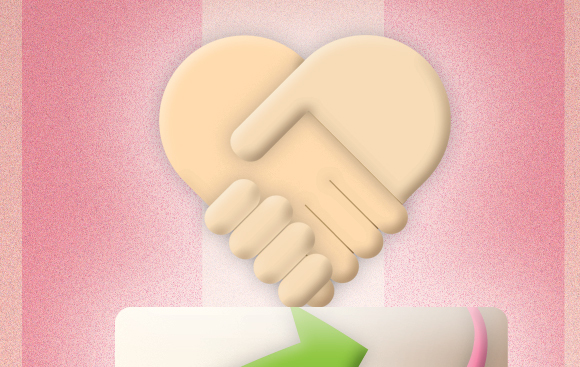 The latter proved too problematic and expensive, so we opted to illustrate it in-house. The next step was to start building the artwork roughly in Adobe Illustrator (below). At this point, Each tier was intended to be decorated wall-to-wall to depict a particular transportation mode. This early rough shows the start of the ocean, road, rail, and air tiers. 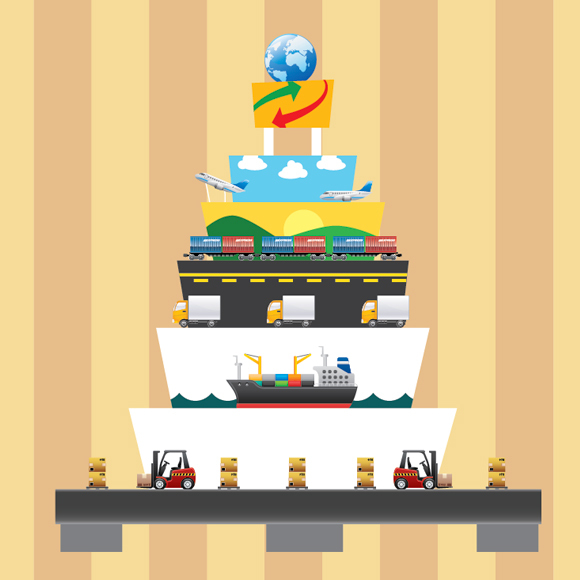 The top tier (with the arrows) represents goods and services moving from place to place, the exchange of information in the supply chain and the back-and-forth relationship between a company and its third-party logistics provider. A quick stylistic test was then done done by exporting the Illustrator artwork out to a layered Photoshop file, then adding depth, shading and texture (bel0w). 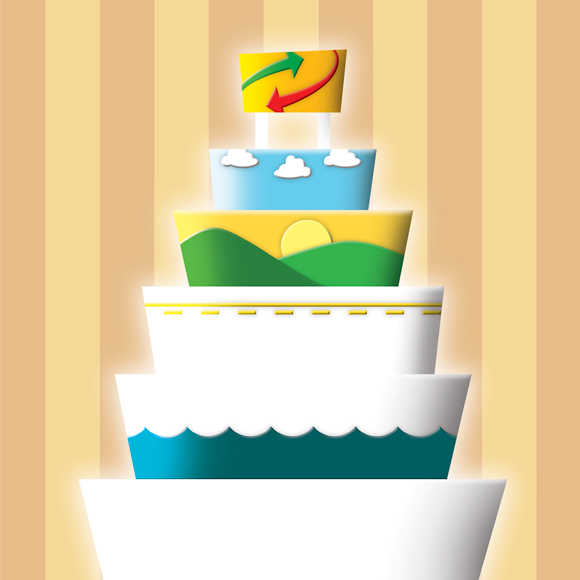 The artwork got approval for style, but the specifics of each cake layer were still evolving. This next phase (below) was me going a bit too far. I played with the idea that each layer would be decorated with little objects—planes, trains, trucks, etc.—the way a cake has little icing flowers and decorations at its outer edges. In reality, this was just way too busy. After getting unanimous feedback to that point from the editors, the decision was made that simpler was better. After backing off that over-worked idea, the final illustration (below) was a much cleaner and more effective piece of art. The funky, angled tiers were replaced with a more traditional, softly rounded cake layer look. Modes of transportation were represented simply with lines and shapes, and the background color scheme was softened to a more wedding-like palette. 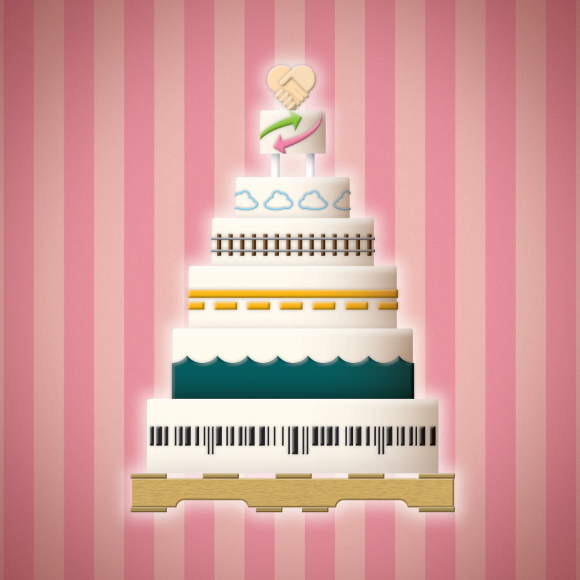 In this version, the plastic pallet previously used as a serving platter for the cake was replaced with a wooden one.